This study is currently being updated for 2018. While the landscape of on-line music platforms has grown significantly since we first started measuring consumer satisfaction of these services, two major players are often compared: Pandora and Spotify. There are apps like iHeart Radio, Amazon Prime, Deezer, Slacker and SoundCloud that give users new ways of discovering music while on the go. For this study, Bridge Ratings focused in on Pandora and Spotify. The reasons are simple: the two differ in their approach to delivering music for its users. Up until this year when Pandora rolled out its Premium streaming platform, Pandora's legacy platform allowed users to create a variety of personal 'radio stations' or music collections based on personal music choices. The Pandora algorithm manipulates to push or serve a string of songs to the user who can then rate them (thumbs up or down). This further refines the list of songs pushed to the user. Spotify's allows users to select songs from their large catalogue of music as well as music that may also be on the user's hard drive to create playlists of songs customized in a variety of ways. Music discovery is a key attribute of Spotify which is driving growth. Both services offer a free and subscription option. The two services have a large worldwide user base though Pandora has not been available in many international markets while Spotify is available worldwide. Recent trends supported by a number of independent research companies - including Bridge Ratings - confirm attrition in time-spent and number of weekly visits is evident in monthly active Pandora users. We have found that much of the attrition is credited to Spotify and, in particular, as fans of streaming music platforms become familiar with both Pandora and Spotify, they are becoming more sophisticated in the manner in which they use these platforms. An increasing number of music streaming consumers are utilizing more than one platform to satisfy their listening preferences. This chart compares monthly active users (including paid subscribers) for both companies. (Sources: Corporate press releases 2/2017). Pandora is at a distribution disadvantage because it is not available in as many countries as Spotify, but the trends nonetheless are revealing. What is hidden in this chart is how dissatisfaction with Pandora is positively impacting Spotify. "An increasing number of music streaming consumers are utilizing more than one platform to satisfy their listening preferences." - Dave Van Dyke, President Bridge Ratings. Satisfaction with on-demand streaming services varies widely as depicted in this most recent analysis for full year 2017. 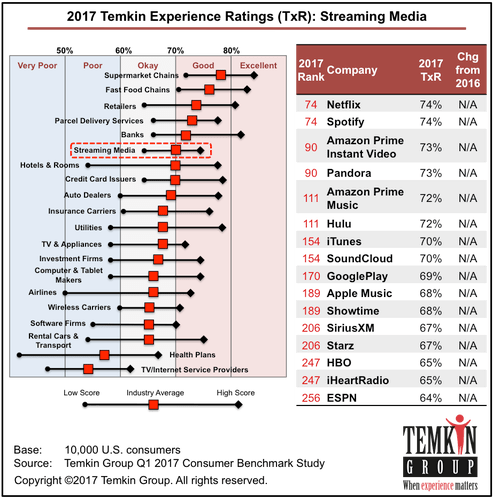 While our study focused in on Pandora and Spotify heavy users, this Tempkin chart reflects a wider, "big tent" consumer base. Here, for the first time, we can see the momentum in growth Spotify is enjoying is sourced - at least in a significant part - from Pandora users who have added Spotify's platform to their streaming choices. As an update to Bridge Ratings' "Pandora Satisfaction Study", we are now able to share a comparative look at the two services in the area of satisfaction. Analysis of user satisfaction is based on a sample of each platform's users who we classify as "Primes". "Primes" are defined as users of the service who use the service as their primary platform for music streaming on the internet who spend at least one hour per day with the platform. The study also segmented users into time-use categories, i.e. identifying how long they have used the service. This segmentation allowed us to have clarity on the platform's use over time to determine if behavior and satisfaction changes over time. Use categories ranged from new or recent users to the service (0-3 months of weekly use) to those who have used the service for more than two years. Pandora satisfaction in these bi-annual studies has deteriorated over time with more use. Time spent and number of daily sessions decline over time. Bridge Ratings was curious if this is simply a natural phenomenon of fatigue of music services in general or if it was specific to Pandora. In the new study fielded during the month of January 2017, we can see the two services side-by-side in user satisfaction. Satisfaction TRENDLINES for each service tell the story. How to read: Each set of bars represents user satisfaction for these streaming services. Each bar represents users based on time spent with each platform (6 months or less, 6-12 months, 1--2 years, etc). 41% of active Pandora users who have used the service for two years or more were "Highly Satisfied" in January of 2015. In January 2017 that number is 33%. Pandora satisfaction for users of both their free and subscription service has settled in the 75% range for those who have used the service for six months or less who are "highly satisfied" with their experience. High satisfaction scores for new or recent users to Spotify is 95% in this latest study and retain their high positives across all user time categories. When comparing long-term users of these services - those having used the service for more that two years, the differences are striking. Even after two years of use Spotify retains an 80% "Highly Satisfied" score. The attribute portion of the study spotlights satisfaction differences. Spotify's attribute advantages include perceived song selection and lack of song or artist repetition. It must be pointed out, though, that the differences in the services provide likely reasons. Repetition as a negative attribute on Spotify is highly customized by virtue of which songs the user selects to place in their playlists and ultimately stream. For Pandora, choice of artist or song repetition is not controllable except for the "thumbs up/thumbs down" component of Pandora voting. Still lack of repetition is a significant strength for Spotify as is song selection. Pandora leads in "ease of use" and "customization". Pandora also leads with perceived song and artist quantity. Some popular artists are not available on Spotify as of this report. We also found that each platform has unique attributes which satisfy specific user needs. These unique attributes steer preference. For example, among women 25-49, Spotify tends to be favored in the attribute of "plays a higher percentage of songs I like more often". Other attributes that steer preference depend on the type of music consumer. Audiophiles with eclectic taste in music may find not many of their favorite artists on a particular service. New music discovery - fans of unfamiliar songs or artists find Spotify's sharing component a high reason to use the service more because they discover more new music through sharing playlists with friends. It has been shown in a number of independent studies that Pandora's growth has slowed or has begun to shrink. This was expected as being the first major platform to distribute music free to the public it perfected its algorithms and marketed wisely and saturated the market. Meanwhile, competitors began sprouting and in the last two years Spotify has improved their approach to playlisting and music discovery - two significant touch points where they exceed consumer expectations over Pandora. This year Pandora is rolling out its on-demand platform built on the technology of Rdio which they purchased for just this purpose. Pandora Premium - at $10 a month - allows consumers to stream songs, playlist at will and even save offline for future listening. This new service is attempting to differentiate itself from other streaming services with personalization features and a more simplified music app. Pandora is expecting a portion of their current platform users to try Premium and upgrade at about a 10% rate of their current user base. As this base grows, Bridge Ratings will conduct further analysis into satisfaction levels of the service itself and how it compares to others. Other considerations for ease of use include the mobile app component. A majority of on-line streaming now occurs through mobile devices. In this study, Spotify is considered one of the best music streaming services available for iOS and Android devices. Spotify consistently updates and refreshes its look based on its users demands. Spotify’s interface is user friendly and sports a beautiful black theme. Pandora offers a great radio-type experience for listeners who don’t want to put too much effort into selecting music, Pandora is perceived to have a better song selection algorithm than Spotify’s radio selection, however with the amount of features Spotify offers for the monthly cost, it may provide you with a lot more value. Overall, in this study, Spotify is preferred, though each has its own attribute strengths. Individual user need directs preferential differences. This study was based on responses from a national sample ofpersons ages 12+. 3118 Pandora Primes, 3020 Spotify Primes. "Primes" are defined as prime users of a specific service whose preferred platform for streaming music they spent at least 60 minutes a day with. Sample error: +/- 1.8% with a 90% confidence level. Studies for the following charts: "Pandora Session Use Over Time", "User Satisfaction: Pandora vs Spotify" and "Primary Attributes" were conducted during an additional series of samples in January 2017. Time-spent and daily visits metrics were sourced from weekly electronic diary methodology. My preferred streaming service is not listed. This study was based on responses from a national sample of persons ages 12+. 3118 Pandora Primes, 3020 Spotify Primes. "Primes" are defined as prime users of a specific service whose preferred platform for streaming music they spent at least 60 minutes a day with. Sample error: +/- 1.8% with a 90% confidence level.